Turbine Blade is important. 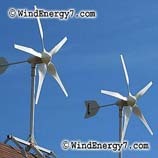 If the Turbine Blade is not correct the Turbine Blades may have to be redesigned on other systems. This is why WindEnergy7 has put so much emphasis on good turbine blade designs. our turbine blades have enough pitch to work in low wind, but not too much that creates vibration, drag, and noise. 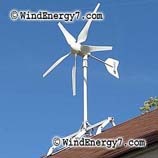 The systems pictured are inventions of WIND ENERGY 7 and are only available from the website at WindEnergy7-com or one if their dealers. The proper mix of Renewable energy and non renewable energy is a public concern for many reasons. Non renewable energy costs like oil, gasoline, natural gas and all non renewable energy sources are going up in cost. The world has limited resources and these non renewable energy resources come for unstable and hostile countries. That’s why the US and other countries have been working towards renewable energy resources to power their economies. 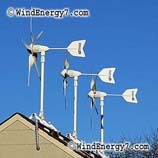 This entry was posted on Sunday, October 2nd, 2011 at 9:31 PM	and is filed under Uncategorized, wind energy. You can follow any responses to this entry through the RSS 2.0 feed. You can leave a response, or trackback from your own site.